Returning to her hometown of Georgetown, artist Kristen (Hand) Ambrosi shares a vibrant collection of paintings developed over the past two years since relocating from outside NYC to Fairfield, CT. Forty canvases of varying dimensions bring color and visual interest to the walls of the library’s Reference Room, Children’s Room, and Meeting Room. This exhibit is now on display until September 29, 2018. Please join us for an opportunity to meet the artist at an Artist Talk on Saturday, September 15 from 11 am to 12 pm. 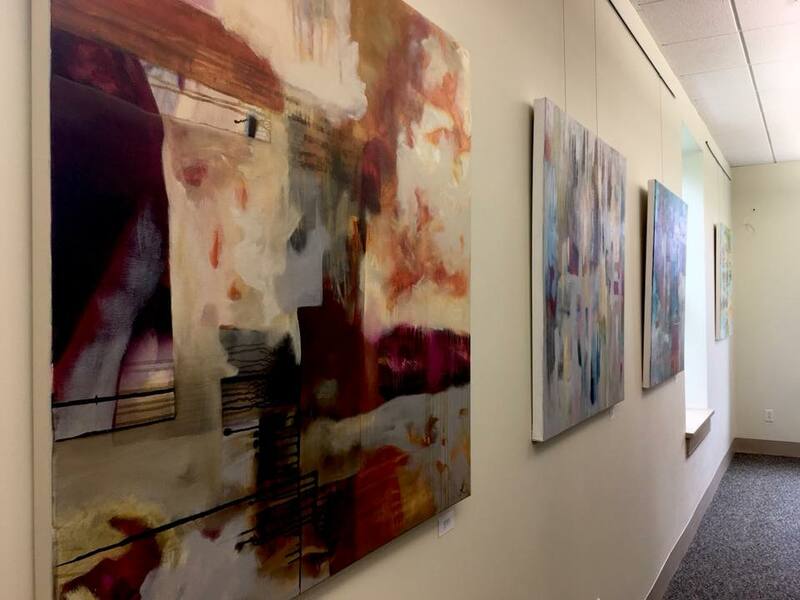 Formal training culminating in a Visual Arts degree from Bowdoin College combined with supplemental study with mentor Flora Bowley has led to the evolution of Kristen’s work to embrace an intelligent, intuitive, abstract style celebrating color and form, always prioritizing an aesthetic of beauty. Creative across many forms, Kristen is an artist of both independent and commissioned pieces, a vocalist of devotional music, and a highly certified yoga instructor: she offers private and group instruction weaving together art, movement, and mantra at her studio at Nest Arts Factory in Bridgeport, CT. Follow her work on Instagram and Facebook at Kamandalu Studio.